Hi people - I thought a little farm update was long overdue (oops, how did two whole months pass since my last post?!)! Things have been super busy in the garden, but the vegetables are starting to roll in which is nice. The garlic is all cleaned and ready to go, the last of the onions are curing as we speak, half the dried beans have been harvested and await threshing, and I'll start digging potatoes this week. 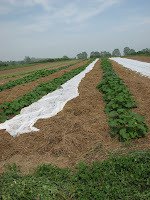 The picture to the right is of the squash and pumpkins soon after they made their garden debut in June. It's hard to believe that they too will be harvested within the month! The fall harvest crunch has definitely arrived, which should keep me and the Orchard Hill bunch on their toes for the next 6 weeks - at least the great rain we just had will save irrigating, and make some carrot, parsnip, beet and cabbage plants very happy. I also wanted to announce the date of the Fairmeadow Farm Fall Garden Walk - a chance for members (and anyone they'd like to bring with them) to come and visit the garden before the season starts - on Sunday, September 28th from 1-2 pm. For those of you in Orchard Hill Farm's summer CSA, you might notice that this is right before their Fall Harvest Party later that afternoon...I hope if you were planning on attending their pot-luck you can come a little early for the walk (or, if you come for the walk I hope you can stay for the party!). I am really looking forward to meeting everyone that I haven't yet, answering any questions you might have, and touring the garden as half of it winds down, and the other half just gets into the swing of things. Hope you can make it! The walk will take place at the farm, and the address and a map can be found further down on the blog. And lastly, there is still quite a bit of space left in the garden, so please pass along a brochure or the farm's contact info to anyone who you think might be interested in joining. With the enticement of fresh, yummy vegetables right through to January, the opportunity to support a small, local farm, and the possibility that we too might have grown a giant winter radish baby (such as the one I am holding pictured at left from last year), who could resist becoming a member?! I hope no one!